The project is a $350 million partnership between the U.S. Army Corps of Engineers, the Commonwealth of Massachusetts and Massport. 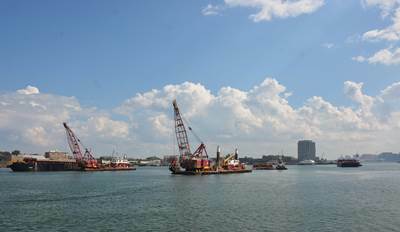 The maintenance dredging of the inner harbor was completed in December of 2017. The deepening of the main ship channels began in July 2018 to accommodate the large container vessels calling today and in the future. The multi-phase dredging project supports continued growth at Conley Container Terminal, which has achieved four consecutive record-breaking years for volume. The Port and Terminal generate $4.6 billion in economic activity, support 7,000 direct jobs and service exports and imports for 1,600 businesses across Massachusetts and New England.